With numerous exceptional golf courses in Orlando, it was difficult to narrow the field to just 10 Orlando golf courses. Unfortunately, some past favorites failed to make the list with several other good golf courses. After surveying golfers and golf course operators while taking into account our staff's personal experiences, we have finalized the 2018 Best Golf Courses in Orlando. Our Orlando golf course rankings are based on course conditions, course design, guest service experience, cost, playability, accessibility and location. There are more than 100 public layouts in the Orlando golf marketplace, but we made the task of choosing your next Orlando tee time a little easier by narrowing the list down to the top 10. Enjoy playing golf in Orlando. Open to daily fee and resort play, Shingle Creek Golf Club tops our list for Best Golf Course in Orlando. Shingle Creek has it all...course design, tournament quality conditions, first class service and a perfect location. Located just one mile from the Orange County Convention Center, Shingle Creek Golf Club and Resort merges the modern resort experience with the natural feel of the historic "Shingle Creek"...surrounded by nature and wildlife. Shingle Creek Golf Club is also a Greens of Excellence award winner. Shingle Creek, Orange County Nataional and Southern Dunes Golf Club topped the list for Best Greens in Orlando. If you had just one round to play golf in Orlando, it would be difficult to bypass Shingle Creek for another venue. 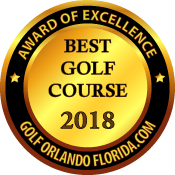 Congratulations to Shingle Creek Golf Club for being the 2018 Best Golf Course in Orlando. Orange County National features the Panther Lake and Crooked Cat courses for 36 holes of championship golf surrounded by nature in a tranquil setting. Orlando County National Golf Club has played host to the 2003, 2005, 2007 and 2010 PGA TOUR Qualifying School Finals. In addition to 36 holes of championship golf, OCN has a 9 hole short course, 360 degree driving range and a 46 room lodge to accommodate stay and play package. Orange County National is a "Must Play Orlando golf course." Orange County National is consistently rated as one of the best Orlando golf courses and 2018 is no different. Orange County National has earned recognition as the Best Public Golf Course in Orlando 2018. With some recent renovations and rejuvenated course conditions, Falcons Fire Golf Club earned recognition for the Best Public Golf Course in Orlando 2017. Falcon's Fire was barely edged out for the top spot by Orange County National this year, but easily remains a Top 5 Orlando golf course. The Rees Jones Signature designed Falcon's Fire Golf Club features 6,901 yards of classic architecture, an exquisitely maintained course and year round playing conditions. With its classic golf course design, unique terrain and year-round tournament playing conditions, Falcons Fire Golf Club is arguably one of the top Orlando golf courses. White sand bunkers, grass mounding and natural water hazards border the pristine fairways for a visually aesthetic and picturesque setting. Photo opportunities abound at Falcon's Fire. Located within minutes of Walt Disney World Resort in the heart of the Orlando attractions district, Falcons Fire offers great golf in a great location. Highly regarded as a first class golf resort, ChampionsGate Golf Club is home to both the National and International Courses. Greg Norman designed the 36 holes of golf to offer golfers a blend of tradition and modern elements and to create a unique golf experience. ChampionsGate once again earns designation as a Top 10 Orlando golf course. The International course at Champions Gate offers a golf experience unlike any other in the Orlando area, but one that will be familiar to those who have played the links courses of Scotland and Ireland. A great venue for 36 holes in one day. The International course provides a stern test of golf. Considered the best luxury golf experience in Orlando, Ritz-Carlton Golf Club is set within the pristine Headwaters of the Florida Everglades and surrounded by magnificent pines, palmettos, and live oaks. This distinguished Orlando golf resort offers a luxury experience unlike any other in the area. Ritz-Carlton Golf Club, designed by two-time British Open Champion Greg Norman, combines an array of features to provide a challenging yet fair test of golf. The course requires players to think their way through an array of water hazards, strategically placed bunkers, and demanding greens complexes, always meticulously groomed. Ritz-Carlton Golf Club is one of the most challenging Orlando Golf Courses. The only negative is the "Luxury Price Tag", which keeps Ritz-Carlton Golf Club away from the top spots in the rankings. If price is no object, the Ritz-Carlton Golf Club Orlando should be high on your must-play list. Opened in 1996, the course is protectively framed by borders of native trees and natural wetlands and speckled with clusters of native oaks, pine and magnolia trees - a pristine, scenic wonder. With impeccable playing conditions, exceptional guest service and a natural setting, Celebration is widely recognized as one of the top Orlando golf courses annually. Celebration Golf Club was designed by the father and son team of Robert Trent Jones, Sr and Jr. Featuring 45 holes of Jack Nicklaus designed championship golf, Grand Cypress is consistently one of the Top 10 Orlando golf courses. The 27-hole North/South/East Course provides the ultimate test of accuracy while the 18-hole New Course provides a Scottish links masterpiece. The cost of Grand Cypress is a little pricier than other Orlando golf courses on this list, which bumps it down slightly in our rankings. Grand Cypress Golf Club continues to be one of the better Orlando golf courses since opening in 1984. Congratulations to Grand Cypress for being named the Best Resort Golf Course in Orlando 2015. Tranquilo Golf Club at Four Seasons Orlando is the newest addition to the Orlando golf landscape. The price tag may scare most people off, but the quality of conditions can not be denied. Formerly Disney’s Osprey Ridge golf course, the original Tom Fazio layout was redesigned, renovated and revitalized resulting in a new, enhanced golf experience. Surrounded by native wildlife in a secluded, tranquil setting, golfers will be challenged by topography unique to central Florida. Tranquilo Golf Club features varying elevation changes unique to Florida and meticulous fairways meandering through wetlands and Southern Live Oak trees. It should be no surprise to any Orlando golfer that Southern Dunes Golf Club appears on our list of best golf courses in Orlando. The nationally recognized Steve Smyers' championship design has been a favorite since opening in 1993. Southern Dunes rolling fairways carve through large sandy scrub areas to create a "Dunes" atmosphere amid a challenging, well groomed championship golf course. Located 25 minutes from Orlando, Southern Dunes Golf Club continues to receive numerous awards and accolades annually. The Waldorf Astoria Golf Club is one the newest additions to Orlando golf courses and opened with lofty expectations in 2011. With immaculate playing conditions, a classic course design and exceptional service levels, this Rees Jones championship design remains as one of the Top 10 Orlando golf courses. With the exception of cost, this Best New Golf Course in Orlando 2011 rated highly in our review criteria. If cost is no object, the Waldorf Astoria Golf Club should be placed near the top of your checklist of must play Orlando golf courses.